Happy Holidays to you all, and a safe and prosperous New Year! 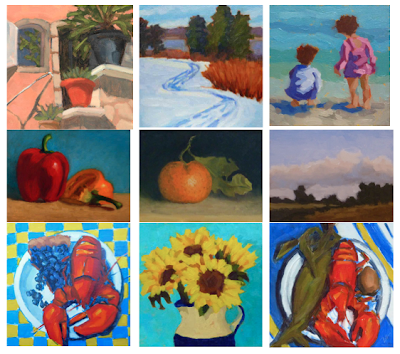 Last week on Wednesday, I painted with the Plein Air Painters of Maine in Portsmouth, at the Strawberry Banke Museum parking lot. We'd had a lot of snow, but the sun was shining and it was a great time. Here's to more of that next year! I'm excited to finally show my finished woodcut from last week. See number 4 of the series of 8 above. It's a three color reduction woodcut, with a small amount of the white of paper used as well, of the Irish Piper. She's a fishing boat that lives near our cottage in Maine. It was such a great experience working with Don Gorvett. 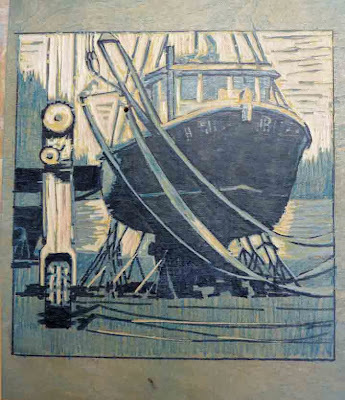 I thoroughly enjoyed it, and would love to do more woodcuts. I was disappointed on Friday when I realized I had forgotten to take a photo of the final prints! It was great to go back today and bring home the finished product. 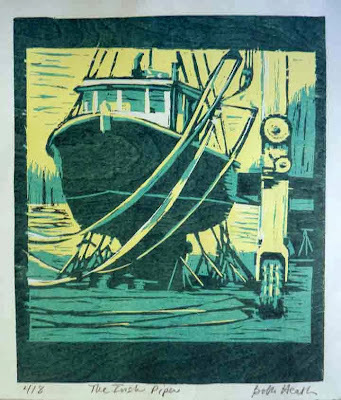 A print after the blue layer, which is green due to the yellow layer underneath. 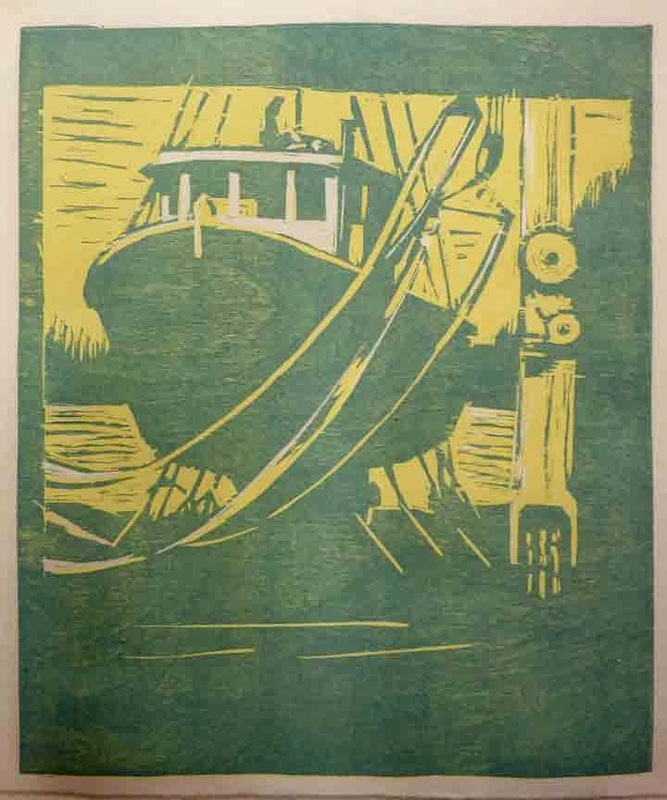 A little white shows on the boat cabin, from cuts prior to printing the yellow layer. The block after an initial print of the blue layer, with additional cutting (the light areas). Today was day 3 of working on my woodcut project with Don Gorvett. On the first day, I transferred my drawing to the board. On day two, I made just a few cuts that would show the white of the paper, and printed the yellow layer. I'm not showing a photo of that, it's really pretty hard to see anything but yellow! Today I did a lot of cutting, to expose everything that would be left yellow. The top photo shows one of today's prints. The blue came out pretty green, due to the yellow layer showing through. I was able to vary that from print to print, some are more blue. The bottom photo is the block after an initial print, just to get an idea, and then some additional cutting. 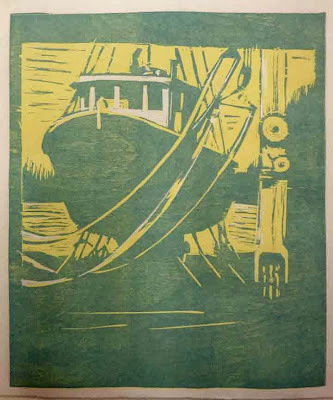 The print above was done with the block in this condition. 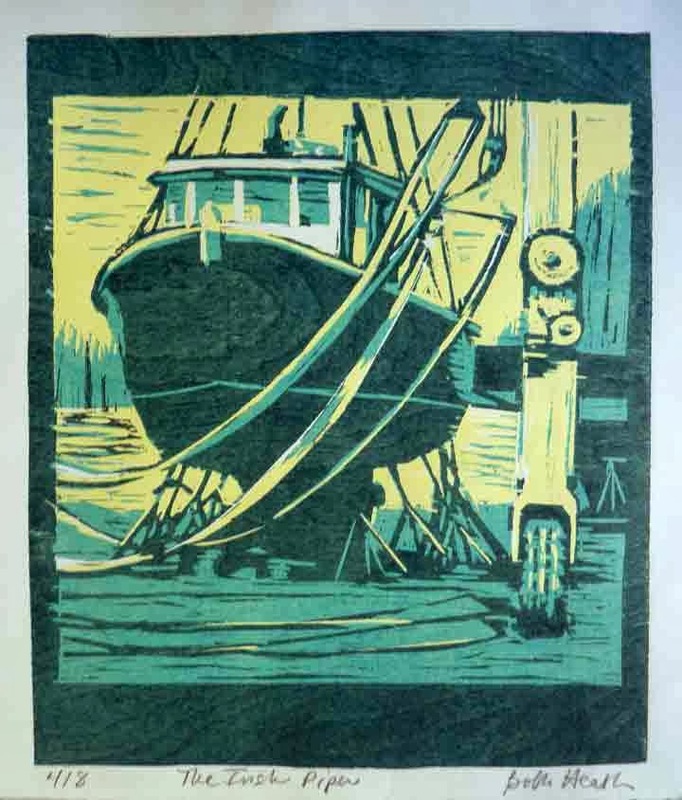 One more day and it will be done, a reduction woodcut series of eight prints. 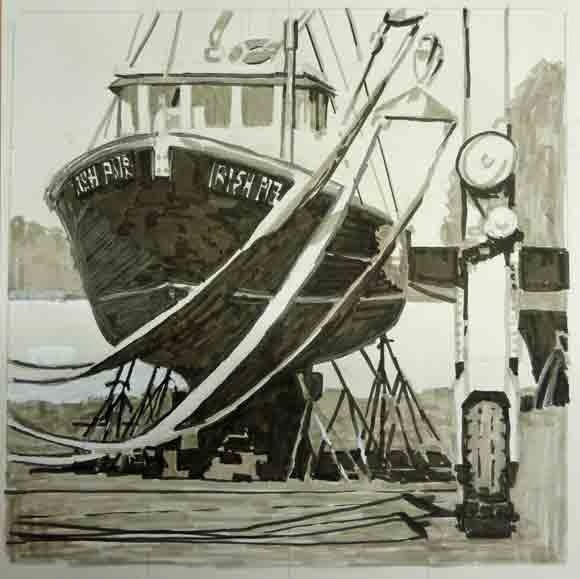 I'm fortunate this week to be studying print making with Don Gorvett. 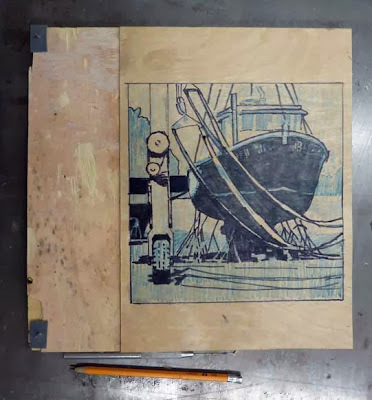 What Don does is called reduction woodcut printing, because the image is cut into a wood block, and more of the wood is cut away as each layer of ink is applied to the prints. The result is as dramatic as it is beautiful. The top image is a drawing in three values that I made before heading to Don's studio this afternoon. I painted this scene earlier this year, and still love it. It seemed like it would make a good woodcut print. Don showed me how to transfer the drawing to the block he prepared for me, and how to put in the registration pins (sticking through the gray tabs at the left end). Tomorrow we are going to print the first color, I'm still thinking about whether there will be 3 plus white or just three colors. It's really fun! Looking for something for the art lover on your Christmas list? Or do you need a nice little painting for the guest room or that empty space in the hall? Maybe I can help, I'm having a Holiday Sale! Check it out for some really nice paintings at great prices. Shipping is free within the US. 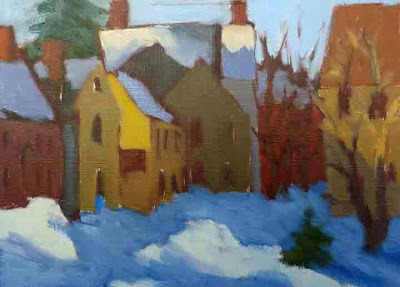 The Holiday Sale can be found on my blog as a new tab, called Holiday Sale, to the right of the Home tab. Or use the link above. The Holiday Sale runs through December.